You know your Sun Sign, but your Moon Sign is just as important. The Moon has called the Soul or embodiment of the Soul. She represents our unconscious Self. The Moon's sign and house placement tells of our needs and where we find security. She is our Mother, the way we wish we could be mothered, the way we nurture others. Children often express their Moon sign more clearly than their Sun Sign. The Moon sets our rhythm in life just as she rules the tides of the ocean. What was the Moon phase when you were born? New? Full? Crescent? This has a large influence on the way you look at your life's purpose and what you expect to give and receive. Much more ancient than Sun Astrology is Moon Astrology. Come and celebrate your lunar side. No previous knowledge of Astrology is required. In the computer age, we can begin the study of Astrology with interpretation rather than mathematics. In five lessons you will learn the basics of Astrology: signs of the Zodiac, Planets, and Houses. Using your own chart, we will compare and contrast the makeup of each horoscope in the class. The course is taught from a humanistic perspective viewing the astrological chart as a tool for self-knowledge. Tarot is an oral tradition best learned directly from a teacher. Perhapes you, like many of my students, have struggled with attempts to learn to read the cards by using books. Tarot is a language of symbols, which opens our intuitive eyes and allows access to very ancient wisdom. 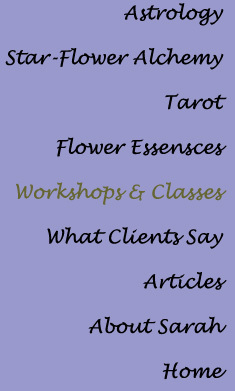 Beginners learn the organization and history of the Tarot deck. learning ot read simple spreads begin with the first lesson. 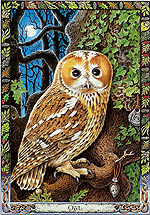 You develop your own set of interpretations for the cards through an explanation of the symbolic contents of the images pictured on the card, and through exercises designed to help you trust and broaden your intuitive skills. Each class begins with music and guided meditation which helps you access other levels of knowledge crucial to becoming familiar with the Tarot. 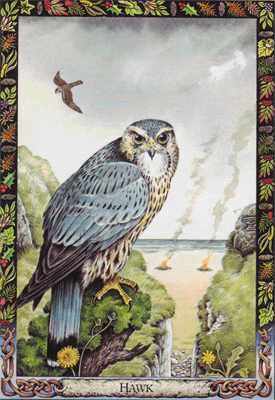 Continuing Tarot classes explore the cards and their meanings in greater depth and range. In all of our studies we seek the wisdom behind these powerful and ancient symbols. These classes are an opportunity to advance your card reading skills, to learn particular techniques and to go in depth into individual cards that are the most difficult to interpret. A journey in depth to the archetypes, symbols and powers of the 22 cards which hold the key to the wisdom of the Tarot. Druids, ancient keepers of earth wisdom and sacred language, see the world as a place of infinite beauty and magic, where everything is alive and full of meaning. Present day Druidry has retained the outlook of the ancestors of modern Western people, and its nature-based spirituality has much in common with the worldview of indigenous peoples. 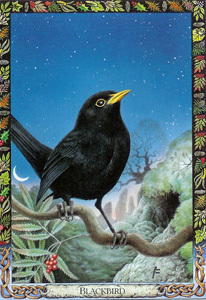 While communications from other realms can't be read in the usual way, Druidry teaches us to read wisdom from the wind, the flight of birds, the sound of flowing water and the stars above. Through a series of experiential exercises, workshop participants will learn how to access this other language, to sense energy patterns in plants and stones, and open to the guidance of earth spirits. Druidry teaches us this deeper connection to the natural world, and also introduces us to the invisible world - to the realm of faeries, nature spirits and the layers of reality we call the past, the dead, or the future still to come. This workshop will introduce you to the principles and practices of Druidry. Guided visualizations and other activities will help you expand consciousness and open to creativity — the Druid way.